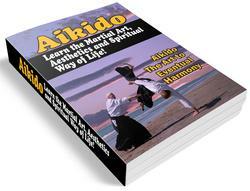 Ikkyo-undo (the "first-exercise) is yet another way of aligning with uke's energy, matching speed and direction. Arms swing forward and up, fingers extended, stopping at forehead level. 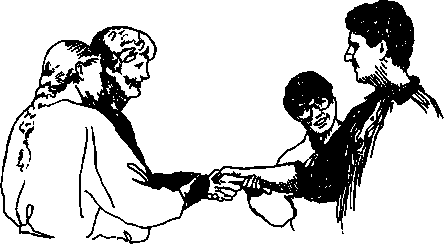 Arms drop to sides, hands softly closed. Hips shift back. Pattern is: hips-hands, hands-hips. Pushing forward from small of back. 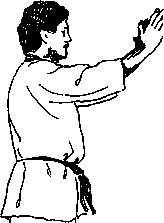 Strikes shomen-uchi with hand (see "Block Hands" on page 112). A plastic bat is roughly equivalent to the traditional bundle of bamboo. It's noisy when ikkyo is incorrect, but causes no harm — and ikkyo improves immediately. After spending weeks observing classes to see how these Aikido people were "faking" their throws and falls, I saw an attacker came in with a heavy stick in an overhead strike that could easily have smashed an arm. But he never reached his target; nage came gliding in, blended with the motion, threw uke and even ended up with the stick. At that point I no longer cared if it was faking — teach me how to fake like that! They did.